the past week has been exceedingly ... emotional. last friday, i received some incredibly sad news about a friend of mine from high school, the kind of sad, horrifying news that is difficult to process and accept. since hearing this news, i've been thinking a lot about high school. i know many people who hated high school, and have always felt lucky that i am not one of them. there were moments of teenage angst, of course, but i genuinely enjoyed my high school years. a large part of the enjoyment stemmed from the close knit group of friends and teammates of which i was a part. even though i have lost touch over the years with many of those people, my sense of a shared community with them remains very strong. i feel lucky to have been a part of such a community when i was in high school ... and feel incredibly lucky to have developed an incredibly strong and supportive community of friends out here in san francisco. but sometimes i think that i take this for granted, i assume that my little community will always be there. and maybe it will. but it can't hurt to take a little time out of each day not just to be thankful for the friends and family you have, but also to tell them how much they mean to you. on the better news front, i received a very exciting call from a friend last night. this friend works for an on-line policy journal of sorts which is looking for someone to write an article on carbon markets. and as of this moment, it's looking like that someone will be me! i know this probably doesn't sound very exciting to all of you BUT given that i desperately need & want journalism experience and that i want to be writing about energy-related topics ... this call was like manna from heaven. i still don't know all the details, but my friend is sending me some stuff in an email and then we'll meet to discuss early next week. yay! 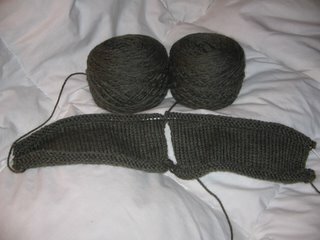 the first four inches or so of the front of the sweater. forward progress is being made. some of you may be asking why i have two balls of the exact same yarn attached to the sweater. after tangling the dangling yarn at least eight times during each row, i was asking myself the same question. the simple answer is that i will be connecting the two sides after about nine inches, and then sewing a nine-inch zipper in at the very end so that i can leave the bottom of the sweater open or closed. it sounds so easy, doesn't it? check back with me on that a week or two from now. tomorrow night, i'm hopping a plane bound for williamstown, and i couldn't be more excited. i'm getting to see my parents, a bunch of swimmer friends from college, and the one, the only ... superbon! i'm plotting a meeting between superbon and my mom in the hopes of luring my mom in to ranks of the knitting obsessed. C- I just spent two weeks studying with some of the "world" authorities on Carbon markets, carbon trading etc... Being still skeptical of our information highway- I hesitate to leave my-e-mail here. if you don't still have my business card get my e-mail from Katie or Deb and I might be able to help out with resources if you write that article.